An undrafted free agent by the Cleveland Browns in 2014 out of Ball State, Snead first saw the field in 2015 as a member of the New Orleans Saints, and he made a big impact straight away. Between 2015 and 2016, he produced PFF receiving grades of 73.3 and 76.7, before having his 2017 season impacted by suspension and injury. In 2016, his yards per route run average of 1.89 from the slot ranked 14th among wide receivers, while he dropped just 6.7 percent of his passes when lined up inside. With just $1 million per year guaranteed, this is a good contract for the Ravens to take a chance on. Brown has produced a Wins Above Replacement level average value of 2.72 over the past three years, which is one of the top figures among wide receivers. Once a sixth-round draft pick, Brown has overcome a perceived lack of size to become one of the best receivers in the NFL. 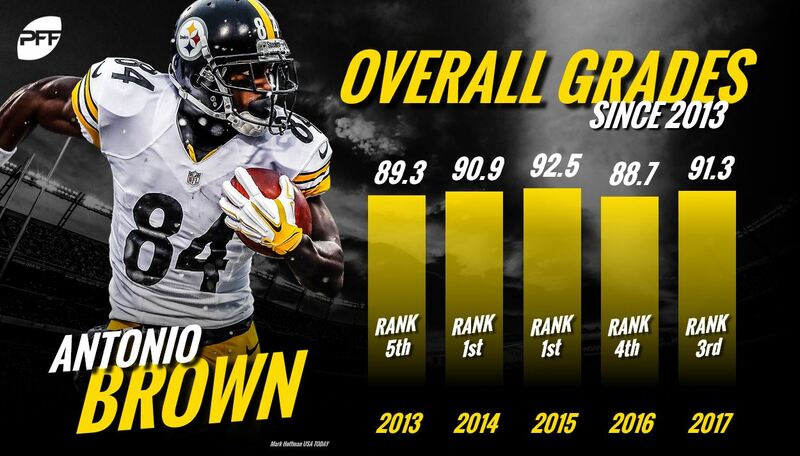 Brown has produced a PFF receiving grade of 80.5 or higher every season he has been in the NFL, earning a receiving grade of 90.0 or higher in four of those eight seasons. Showing off a safe pair of hands, Brown hasn’t dropped more than eight passes in a single season, despite seeing over 100 catchable targets in each of the past five years. Considering just $3 million per year of his contract is guaranteed, Baldwin’s contract is a great value for the Seahawks. 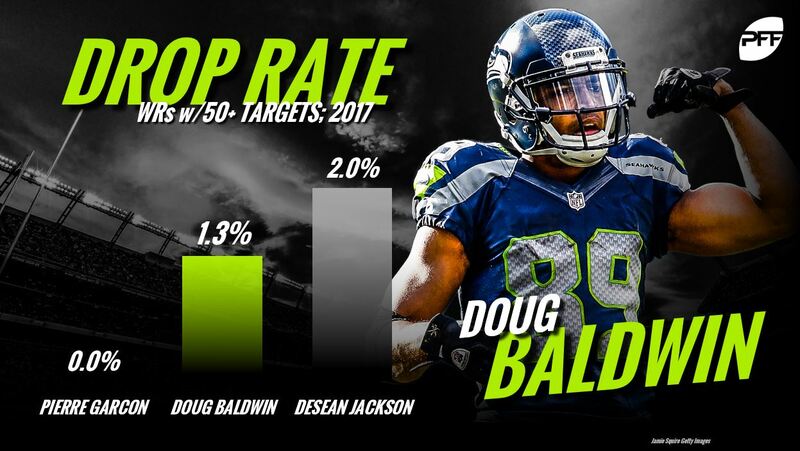 Undrafted out of Stanford in 2011, Baldwin has shown an elite pair of hands throughout his time in the league, producing a drop grade of 90.5 last year with just one drop on 76 catchable passes thrown his way. On top of that, he’s been tough to bring down once he has the ball in his hands, avoiding 44 tackles over the past four season including the playoffs. One of Tom Brady’s favorite targets, Edelman missed the 2017 season due to injury. If you go back to 2016 though, his dominance from the slot really stands out. His yards per route run average from the slot ranked fourth among wide receivers at 2.42, and he dropped just five of the 68 catchable passes thrown his way when lined up inside. Edelman is suspended for the first four games of the 2018 season, and of course, questions remain as to how well he can perform coming off a torn ACL. Amendola signed with the Miami Dolphins this offseason, and with just $2.95 million per year guaranteed, the concerns over his injury history shouldn’t have any implications for the Dolphins salary cap should he get hurt again. Amendola ranked 19th in the NFL with an average of 1.78 yards per route run from the slot last year, and he has produced PFF receiving grades of 70.0 or higher in four of the past eight seasons. Should he stay injury free, he could make a big impact in Miami.